Maret Montanari and Culpwrit at PRSSA Awards dinner. 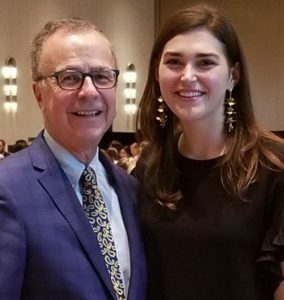 Just returned from Austin, Texas where I met several hundred enthusiastic future PR pros at the PRSSA National Conference. It was especially fun to present my annual mentorship scholarship to someone who is destined to make her mark on our profession–Maret Montanari. Now a senior public relations major, Maret is firm director of Capstone Agency, an impressive 116-person student-run integrated communications firm at the University of Alabama. She also serves on the PRSSA Executive Board at UA, and was named a Female Trailblazer for the university as part of its 125 Years of Women Celebration. Besides completing several PR internships with rave reviews, she was named PRWeek’s Outstanding Student of the Year 2018. When I asked her to reflect on her success and share mentorship advice she gives to students beginning their college careers, Maret didn’t hesitate to rattle off these four important tips. Embrace the unfamiliar: In an industry that changes by the minute, you have to be OK with stepping out of your comfort zone. Staying hungry and seeking out new opportunities that push you to better yourself will sharpen your skill set and make you a more well-rounded practitioner. Stay true to yourself: Ray Kotcher, one of The Plank Center’s Living Legends panelists at the Conference, spoke to staying true to your moral compass, and I couldn’t agree more. By identifying your values early on, you can avoid compromising who you are, both professionally and personally. Seek out mentors: Through The Plank Center, Capstone Agency, PRSSA and many other experiences, I have been fortunate enough to form relationships with some incredible professionals. Truly get to know those around you for they’ve been in your shoes and can offer great advice on how to navigate the good, the bad and the ugly. And don’t discount your peers as I’ve found I often learn the most from those who are right there beside me. Be humble: It’s easy to get caught up in the fame and success we all hope to achieve, but never let your ego get the best of you. Practice humility, and always let your accomplishments do the talking – they’ll speak for themselves. In addition to winning the “Culpwrit” scholarship at the PRSSA awards ceremony, Maret received the Betsy Plank and John D. Graham scholarships. Her campus agency also was named best student-run agency of the year after picking up best tactic and best campaign awards. Excellent advice, Maret. We are a profession where attitude and character play a huge role in a person’s career. And if Ron Culp says you have The Right Stuff, all the right doors are open to you. Maret continually astounds me with her grace, her wisdom and her passion for this industry. She is wise beyond her years. I’m so proud to know her, and I look forward to following her career. I only wish we could keep her at UA. She is destined to become a UA legend.